Verrucous carcinoma is a variant of squamous cell carcinoma. It is of low grade malignancy and rarely present with distant metastasis. Oral cavity is the commonest site of this tumor, other sites are larynx, oesophagus, and genitalia. Verrucous carcinoma in external auditory canal is extremely rare. This is the presentation of a 45-year-old woman who came to the ENT and Head Neck Surgery department of Delta Medical College with discharg from left ear and impairment of hearing on the same side for 7 years. Otoscopic examination showed that the skin of external auditory canal was thickened, papillary and blackish. External auditory canal bone was found eroded. Cytology from external auditory canal scrap showed hyperkeratosis and parakeratosis. Excision of the external auditory canal mass was done under G/A. Whole skin from external auditory canal was excised under microscope. Split thickness skin grafting was done in external auditory canal. The specimen was sent for histopathological examination which revealed as verrucous carcinoma. Subsequently, she was treated by radiotherapy. Six months follow-up shows no recurrence. Verrucous carcinoma is a variant of well-differentiated squamous cell carcinoma. It has specific clinical and histological features. Various names are used to describe this condition including` Ackerman's tumour', epithelioma cuniculatum' and `carcinoma cuniculatum'. The tumor grows slowly and locally. It is invasive in nature but unlikely to metastasize. It appears as a painless, thick white plaque resembling a cauliflower. The most common sites of oral mucosal involvement include the buccal mucosa, followed by the mandibular alveolar crest, gingiva and tongue. Other sites are larynx, oesophagus, and genitalia. Verruous carcinoma in external auditory canal is extremely rare. The age ranges from 50 to 80 years with a male predominance. It may grow very large and can destroy adjacent tissue such as bone and cartilage. The diagnosis is established by histopathology. Surgeon has to provide adequate specimen including the full thickness of the tumor and adjacent uninvolved mucosa for the correct diagnosis. This is the presentation of a 45-year-old woman who came to the ENT and head neck surgery department of Delta medical college with a discharge in the left ear and and impairment of hearing on the same side for past 7 years. She was treated by some topical and systemic antibiotics previously. 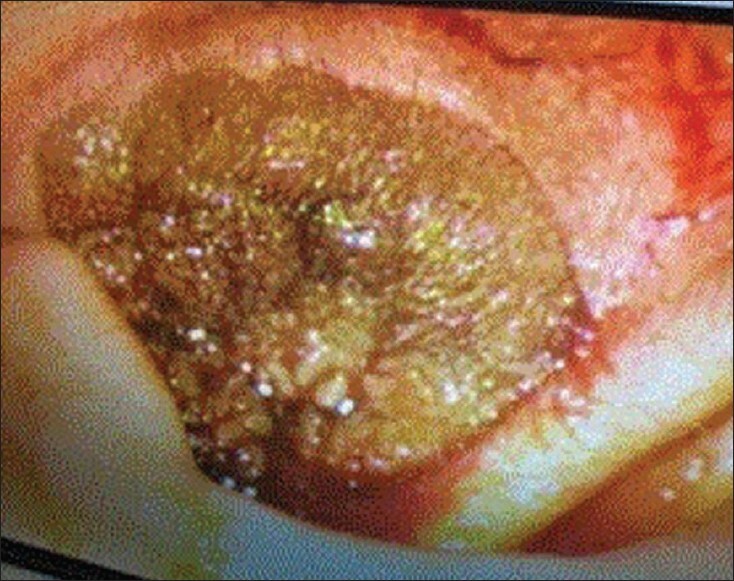 Otoscopic examination showed that the skin of external auditory canal was thickened, papillary, and blackish [Figure 1]. CT of skull did not show any bony erosion [Figure 2]. Cytology from external auditory canal scrap showed hyperkeratosis and parakeratosis. Microscopic excision of the external auditory canal mass was done under G/A. along with the skin of the external auditory canal [Figure 3]. Split thickness skin grafting was done in external auditory canal. The external auditory canal was packed by Bismuth iodoform paraffin paste (BIPP). The whole of the specimen was sent for histopathological examination, which revealed to be verrucous carcinoma [Figure 4] and [Figure 5]. Subsequently, she was treated by radiotherapy. 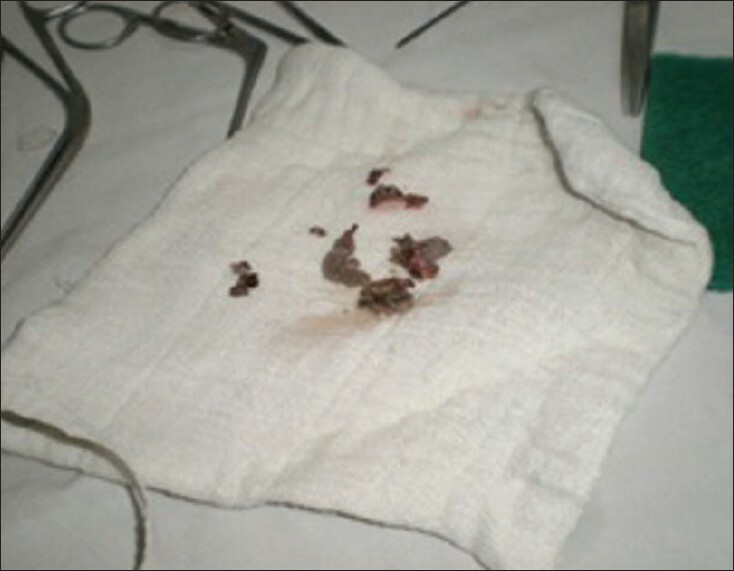 Some parts of the split skin graft were extruded out. Six months follow-up showed no recurrence [Figure 6]. The etiology of verrucous carcinoma is not well-defined. Human papilloma virus (HPV) has been considered one of the causative factors. Smoking seems highly associated with the development of mucosal verrucous carcinoma of the head and neck. Poor hygiene, presence of lichenoid, and leucoplakic lesions may act as predisposing factors. In this report, the patient has no history of such causative factors. Verrucous carcinoma and verrucous hyperplasia are clinically indistinguishable. The clinical association with leucoplakia is significant, and the evidence indicates that untreated leucoplakia may develop into a verrucous carcinoma in time. Verrucous hyperplasia is a forerunner of verrucous carcinoma. The transition is so consistent that the hyperplasia, on diagnosis should be treated as verrucous carcinoma. After surgical treatment, we sent our patient to the department of oncology and was treated by radiotherapy. After six months of completion of radiotherapy, there was no recurrence. Verrucous carcinoma of external ear is a rare condition. 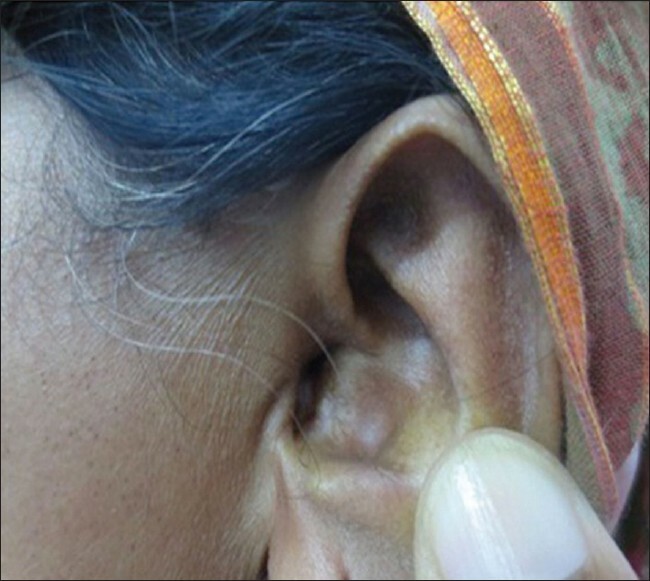 The clinical features are confused with few diseases of the external ear. 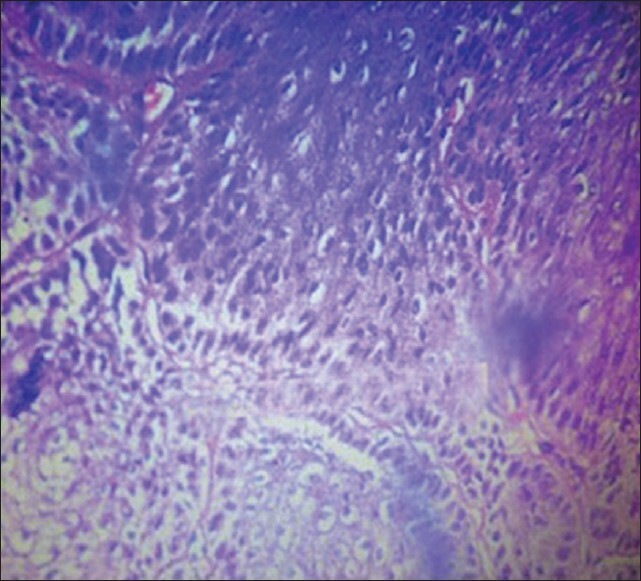 The diagnosis of verrucous carcinoma is confirmed by histopathological examination of excised tissue. Total excision of the tumor mass, followed by postoperative radiotherapy is the treatment of choice and was found effective. 1. Ackerman LV. Verrucous carcinoma of oral cavity. Surgery 1948;23:670-8. 2. Schwartz RA. Verrucous carcinoma of the skin and mucosa. J Am Acad Dermatol 1995;32:1-21. 3. Shear M, Pindborg JJ. Verrucous hyperplasia of the oral mucosa. Cancer 1980;46:1855-62. 4. Medina JE, Dichtel W, Luna MA. 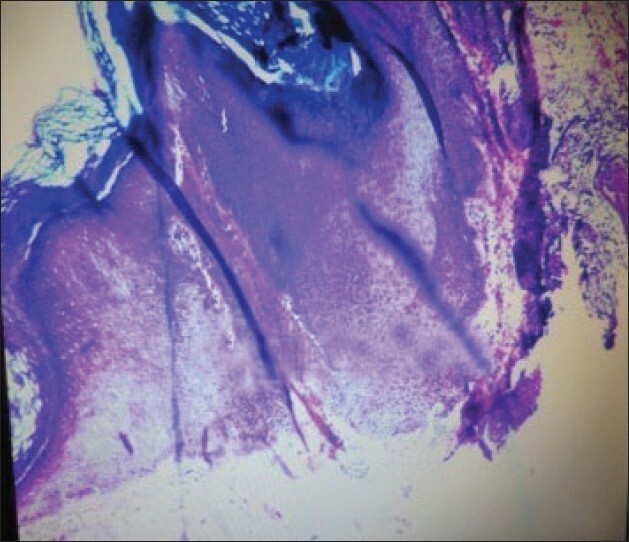 Verrucous-squamous carcinoma of the oral cavity: A clinicopathologic study of 104 cases. Arch Otolaryngol 1984;110:437-40. 5. Koch BB, Trask DK, Hoffman HT, Karnell LH, Robinson RA, Zhen W, et al. 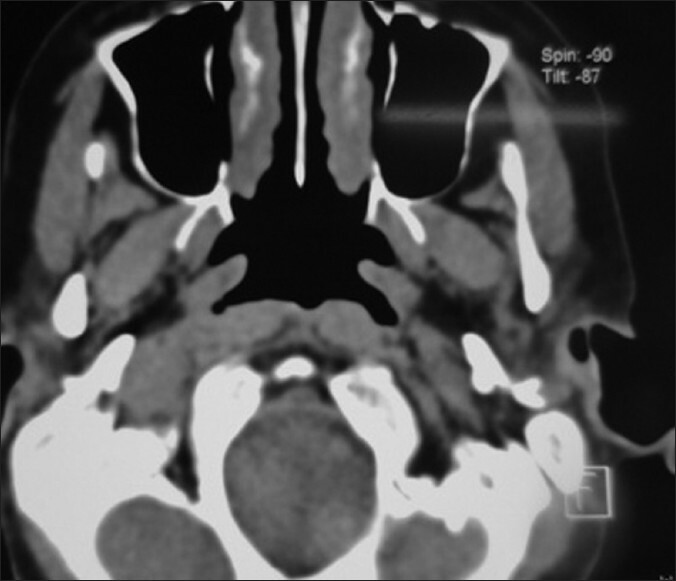 National survey of head and neck verrucous carcinoma. Cancer 2001;92:110-20. 6. McDonald JS, Crissmas JD, Gluckman JL. Verrucous carcinoma of the oral cavity. Head Neck Surg 1985;5:22-8. 7. Murrah VA, Batsakiz JG. Proliferative verruous leuoplakia and verrucous hyperplasia. Ann Otol Rhinol Laryngol 1994;103:660-3. 8. Regezi JA, Siubba J. Oral pathology clinical pathologic correlations. Philadelphia: WB Saunders Company; 1993. 9. Yoshimura Y, Mishima K, Obara S, Nariaib Y, Yoshimura H, Mikami T. Treatment modalities for verrucous carcinoma and their outcomes: Contribution of radiotherapy and chemotherapy. Int J Clin Onol 2001;6:192-200. 10. McClure DL, Gullane PJ, Slinger RP, Wysocki GP. Verrucous carcinoma-changing concepts in management. J Otolaryngol 1984;13:7-12.